Two generous creations, which are also amazing values, can be found at the SL Buddy Walk! Razorblade Jacket has created an adorable set of legwarmers for the event! The legwarmers include two shoe styles, and can be worn with or without the shoes; furthermore, you can use the included HUD to change the color and pattern for one or both legs to any of the 32 options! Yes, you read right! 32 options! Also in the photo is the adorable tank dress from AlterEgo! Not only is the dress super cute, it is also color change by using a supplied HUD! You can choose from nine delightful colors! If you are feeling like showing off some leg and some attitude, you will want to pick up the Mega Spiked Pumps from *Epic*! As you can see, the irresistible pumps look very fetching with the dress from AlterEgo! I mixed n’ match items created by different designers and found in several current events to have a casual grungy look. The events? SL Buddy Walk, The Boutique, The Black Market, TDR Fusion, Skin Fair 2013, Tough As Nails Hunt, SL Fashion Week and Whore Couture Fair. In the quiet hours of the early morning, before most of the world around me is awake, I like to think things over. This morning I’m enjoying my time in a CWNH gift skybox from Vespertine. This comes in a brighter or darker version, and I’m showing you the darker version. Also included, but not shown, is a darling crescent moon lamp! The candlelit fireplace is a CWNH gift from Barnesworth Anubis, and the magazine rack & framed masks are part of a complete furnishing set for CWNH from Cleo Designs. 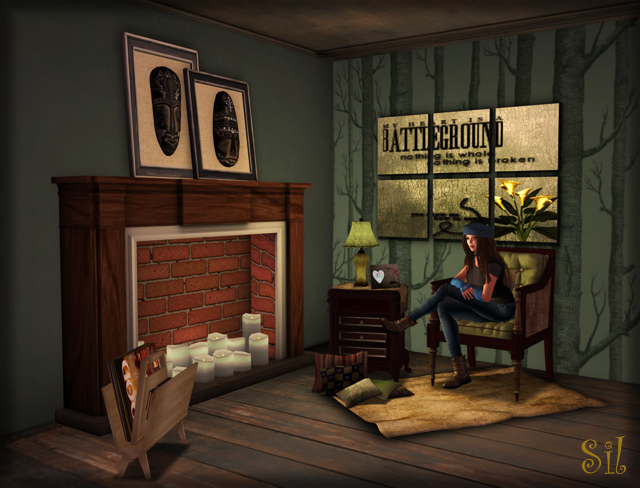 My tufted chair, side table with lamp & frame, rug & pillows, & artwork (Battleground) are all from Prism Furniture for the 4 Walls Hunt! What incredible gifts! My soft & colorful mesh arm warmers are a CWNH gift from Razorblade Jacket. My mesh skinny jeans are a new release from NS — they are a great fit with a nicely rounded shape! My plain black mesh tee is from Corvus. Although you can’t see the detail in the photo, the knit texture is really nice! My hair with a built in color changing hat is from Ploom. Cold Winter Nights Hunt – January 15th – February 15th, a GoofNutz event. General information, hints, and photos! Vespertine – Frostwoods Skybox Darker (CWNH gift!) *Thank you for the awesome blogger gift! Barnesworth Anubis– Oak Fireplace with Candles (CWNH gift!) *Thank you for the awesome blogger gift! Cleo Design – Framed Masks & Newspaper Rack (from Complete Living Room Set) (CWNH gift!) *Thank you for the awesome blogger gift! Prism Furniture – Immerse Yourself Set(4Walls gift!) *Thank you for the awesome blogger gift! Top: Corvus – Black Mesh Tee *Thank you for the awesome blogger gift! Bottoms: NS – Blue Jeans Mesh *Thank you for the awesome blogger gift! Armwarmers: Razorblade Jacket – Mesh Armwarmers (CWNH gift!) *Thank you for the awesome blogger gift!